If you are looking for a brief biography of Dr. Bowdish (e.g. for introductions to seminars), click here and if you’d like a high resolution, recent photo (2018) to go with that biography, click here. Dr. Dawn Bowdish, a Hamilton native, became interested in pursuing a career in science as a high school student when she participated in a co-op program at McMaster University. Under the supervision of Drs. E.E. Daniel and C.Y. Kwan in the Department of Medicine she studied the function of of alpha1- adrenoreceptor agonists. For her undergraduate degree she went to the University of Guelph and studied Microbiology. There, under the supervision of Drs. Lori Burrows (now in McMaster’s Dept of Biochemistry) and Joe Lam, she studied the genetics of lipopolysaccharide synthesis of Pseudomonas aeruginosa, a pathogen associated with lung infections of cystic fibrosis patients. At this point she realized that she wanted to be an academic scientist and went to the University of British Columbia to pursue her PhD in the lab of Dr. 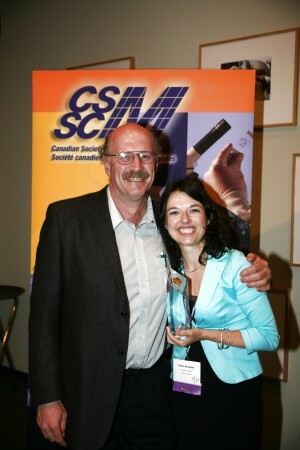 Dawn posing with her graduate supervisor, Dr. Bob Hancock, after winning the Cangene Gold Award for the best PhD thesis in Microbiology for 2005. Bob Hancock where she studied the role of small naturally produced antibiotics (called host defence or antimicrobial peptides) in host defence against infection. There she discovered that these peptides had immunostimulatory properties that could be harnessed as novel anti-infective therapies. This work resulted in a number of patents and the creation of a biotechnology company that is investigating the possibility of using these peptides either preventatively or as novel antibiotics. To further her training she went to the University of Oxford (Linacre) to work in the lab of the world renowned macrophage biologist, Prof. Siamon Gordon at the Sir William Dunn School of Pathology. There she developed a research program to study the role of macrophage receptors in recognition and response to pathogens, with a focus on the causative agent of tuberculosis. Dr. Bowdish joined the Department of Pathology & Molecular Medicine at McMaster University in February 2009 and was promoted to Associate Professor in 2014. Her research focuses on studying the role of macrophage receptors in infectious disease and developing novel immunomodulators.